Anthropics Portrait Professional's latest version includes a few nice changes to the interface and controls, but keeps the same basic structure and functionality. Version 10 ($90, free demo) continues to provide a good platform for making changes to improve photo subjects' attractiveness. As in Portrait Professional version 9, version 10 lets you create minimal to sweeping changes to a face to make it more appealing. Once you upload an image, you mark five spots on it--the outside corners of the eyes, the tip of the nose, and the corners of the mouth. Then you adjust the points on the image to correspond to the features of the face, and click. 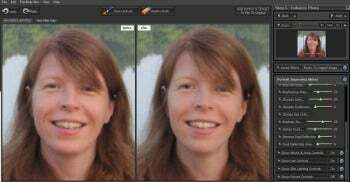 In a few seconds, Portrait Professional 10 changes the features of the face according to its predetermined algorithms that are meant to correspond with beauty, and voila--brand-new face. Once Portrait Professional has done its thing, you're free to make your own changes using sliders at the right side of the screen, to increase or decrease each effect. This gives the user control over the final look while keeping the program simple to use. New in Portrait Professional version 10 is the option to label a subject as a child, giving you a smaller range of controls to correct and beautify the faces of children. Portrait Professional uses algorithms to determine what is needed to sculpt a face to make it more beautiful, but the algorithms it uses generally apply to adult faces, where thinner noses, higher foreheads, and more sculpted jaws and cheekbones are preferred. When these changes are applied to children, the results are strange. In the new version, when you indicate that you are working on a child, Portrait Professional eliminates the sculpting tools that won't "work" for them. Instead of being able to sculpt their forehead, nose, neck, and jaw, you can only make changes to their eyes and mouth. Of course, if you want to use all of the controls on your younger subjects, you can--just don't check the box that indicates that it's a child and you're free to elongate their neck and thin their nose all you want. Anthropics also boasts better algorithms for different textures and ages of skin, including better algorithms for handling men's faces. I tested the sliders on a range of people, including a man in his 70s, a man in his 40s, a woman in her 40s, and a child. Each time, the program did a good job of subtly improving the person’s skin and facial structure, resulting in a more attractive look without going too far into looking airbrushed. Once you play with the sliders and make more changes in various areas, it is easy to go too far, however. And the addition of the Exaggerate button, which takes all of the changes you've made and, well, exaggerates them, seems unnecessary. Perhaps for some, more is more. Of course, you can always undo changes when you've gone too far with the improvements, and Portrait Professional continues to find a good balance of control and ease of use. Portrait Professional 10 costs $90 (though it’s been offeredon sale for a discounted price of $40), with a free trial. Portrait Professional Studio and Studio 64 are geared to professionals and are priced at $129 and $220, respectively. (The discount prices for those are $60 and $120). Studio and Studio 64 both read RAW, DNG, and 48-bit TIFF formats, as well as support color conversions, are optimized for 64-bit systems and come as plug-ins for Photoshop. Studio 64 has no limit on image size. New controls, including a separate set of sliders for sculpting children’s faces, make their debut in Portrait Professional v10.